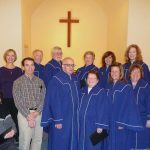 The church choir sings at the 10:30 service September through mid-June. 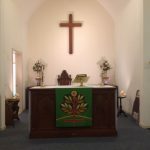 There are also many members who are musically gifted and perform on many Sundays. We are always looking for additional choir members, and musical volunteers to enrich our worship experience. The needlework group is a small group of people with various talents. 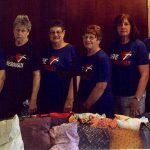 Their work includes breast cancer pillow/bags for several area cancer centers. All are welcome to help. They meet the first Tuesday of the month at 9:00 am at the church from October thru May. The Caring group puts their focus on the unfortunate, both locally and around the world. They look for ways to help those who are in need, both by raising money and implementing programs to help. Those helped include: needy children, the homeless, disaster victims, Garden of Giving, Red Cross, Habitat for Humanity etc. 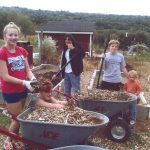 The church has many groups that participate in this effort. New faces are always welcome. Each year dedicated volunteers support our ministries in a variety of ways. 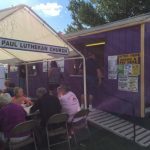 They prepare delicious Pennsylvania Dutch food for the West End Fair with a portion of the profits each year going to our local community and World Hunger. Our menu consists of homemade Dutch filling, turkey bar-b-que, pickled cabbage, hot dogs, and molasses cake. 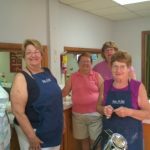 Our Auxiliary members also prepare turkey take out dinners, apple dumplings and celery seed dressing for sale to the community at various times during the year. We welcome you to help us “Share the Love”! 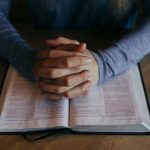 Bible study for adults meets on Mondays at 1:00 pm most Mondays. Please check the calendar under News and Events. The altar guild prepares the altar for worship. There are a variety of paraments, candles, etc., that are used for different services. Special care is taken to maintain and replace any of these items. New members are needed and will be placed with experienced members.